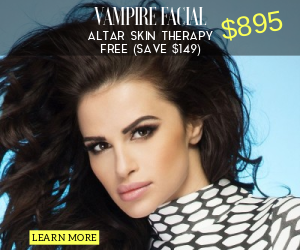 The science of using the healing properties of blood to rejuvenate, heal, and revive the tissue of the face resulted in the Vampire Facelift® and the Vampire Facial®. These procedures (because they provide amazing results for most people and because of the public use of these beauty strategies by multiple celebrities) became a world-wide phenomenon and could still easily be called the hottest new procedures in the cosmetic world. 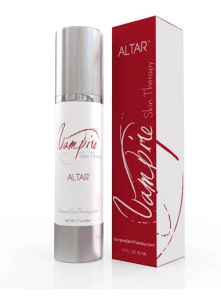 A team of physicians and scientists expanded the science of the Vampire Facial® & Facelift® in multiple studies to result in new strategies for correcting scars and even for healing some of the problems that can cause sexual dysfunction. I think I should discuss this with you from three perspectives: one, the basic science, two, the clinical trials, and three, my hands-on experiences and my recommendations to you. In clinical trials, we subjected Altar™ to an independent lab, which is highly respected in the clinical trials, also, confirmed my consumer perception study. The formulation is extremely helpful and very significant in increasing skin firmness, elasticity and improving the skin texture. My hands-on experience with it, I would divide it into three different experiences. One, about the vampire procedures, Vampire Facelift®, Vampire Breast Lift®, it has been extraordinarily helpful in applying this formulation post procedure. Why? Well, one, it helps repair the skin barrier and two, fundamentally, the two things, the procedure and the topical are doing the same thing, attempting to do the same thing, and that is to increase firmness, elasticity, and texture and to minimize fine lines and wrinkles. Second is with other minimally invasive procedures such a micro-needling [Vampire Facial®] with radio frequency, ablative and non-ablative laser resurfacing, and even fillers so using this topical post-treatment, compliments the treatment, augments the treatment and often one plus one is greater than two. Finally, Altar® has a tremendous role in treating some very difficult skin conditions, and I would include aging in that. Aging, dry skin, people with eczema, psoriasis, those people who are suffering from radiation dermatitis, and even those people who are having an adverse reaction topically to chemotherapy. Why? Well, those things all have three things in common, a breakdown in the skin barrier, dehydration, and some compromise in the microcirculation albeit different. Obviously, people with diabetes have a different microcirculation problem related to arterial sclerosis than say someone with psoriasis in which case it might be shunting. All of those cases, aging, dry skin, psoriasis, eczema, chemotherapy, radiation therapy, they all respond very favorably to the science behind this product, so we’re very excited to introduce this to you. If any of you have any questions regarding it or any concerns regarding it, please reach out to me. I’ll make myself more than available to discuss this with you at any time.